The BOB (Beginning of Book) Awards at the ANWA Conference last week had an original submission deadline of December 31st. There were several different genres to enter the first 500 words of your story (Or possibly the whole thing in the children's book category), but I was so swamped, including one child with a tooth abscess and another with a double ear infection over Christmas day, and then leaving a day late for our family vacation, the deadline came and went and I went, "Oh. Maybe next year." Then the deadline got extended (maybe everyone was as swamped as I was). And when I didn't get Fairy Godfather finished in time to pitch it, I decided to take the $20 dollars I'd paid to pitch and split it between two entries for the contest. I knew I had the beginnings done, at any rate. 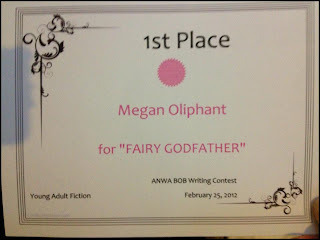 I felt confident about "Fairy Godfather", entered in the middle grade/YA category, and not so confident about "The King Killer" in speculative/sci-fi/fantasy, but they were the best ones I had at the time, so I sent them in. And forgot about it. I wasn't going to win. Not a contest where I was competing against others. The ANWA conference was the highlight of my year so far. So many great classes, hobnobbing with other writers, sitting with Nikki at the Mormon Mommy Writers table selling our "Totally Cliche'" books: I loved every second of it. It went way too fast. Saturday lunch came and I honestly had forgotten about the contest until I noticed the announcing of it in the schedule. I started to get a little excited (Maybe I'd win! ), but I also knew the caliber of the writers I'd be up against. Many of them published already. So when they started the announcing, I kept my anticipation down. I felt genuine gladness for the other women as they went up to accept their awards. I'd even forgotten what categories I'd entered, exactly, since they covered more than one genre. They went through all the rest of the categories, and YA/middle grade was last. I HAD remembered that "Fairy Godfather" was in this category. The tension built as they announced 3rd place. "DeAnn Huff, for 'Master of Emotion'!" And we clapped and cheered as she received her award and posed for a picture. Now 2nd place. "Tanya Parker Mills for 'The School of Guardians'!" And we clapped and cheered as she walked up and took her award and smiled for the camera. It was now or never. Had the judges hated my book? I wouldn't be surprised. I knew I should have looked it over again. Tweaked something. Maybe chucked it all together. If I go screaming from the room, will anybody notice? 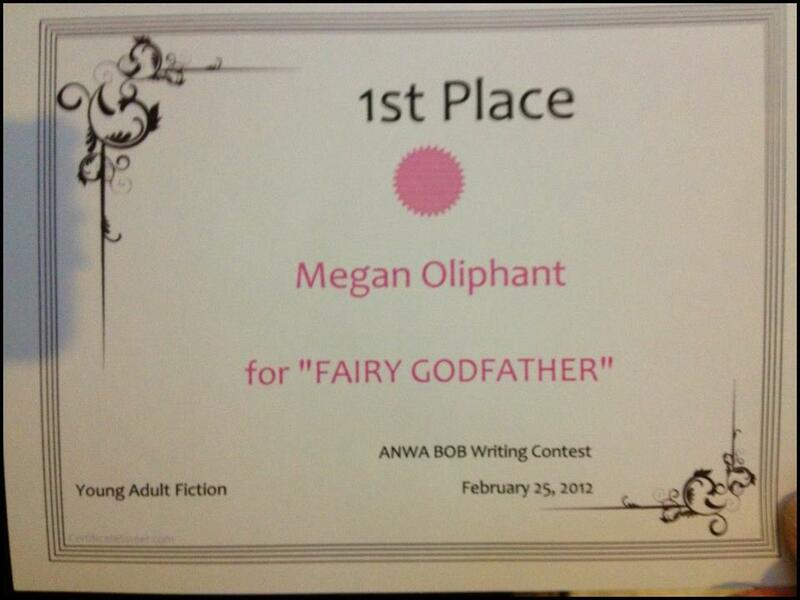 "First place goes to Megan Oliphant for 'Fairy Godfather'!" I WON!!! I squealed like a six year old on Christmas seeing her Cabbage Patch doll under the tree as I rushed up to take my turn to smile at the camera. Through out the remainder of the conference, I would randomly lean over to the person next to me and say, "I won!" I had to keep saying it out loud because I didn't believe it. But here it is. I even have a picture of it to prove it. This is the first time since maybe the sixth grade that I won anything on merit. Sure, I'd done a lot of other things since then, but I got tired of doing everything I could (or not doing everything I could and knowing I hadn't) and then place 2nd. Or not at all. Congrats Megan. I am so happy for you. That's awesome!!! It's things like that that make us think, "Hey, I might be a writer after all!" And you never would have known unless you'd tried. Good for you! You should have heard me screaming for you too!! I was like, "I know her!" LOL! You are so talented, Megan. I honestly wasn't surprised that you won first place! You are amazing! Good job! yes, I 'virtually' screamed it while imagining jumping up and down like a 6 year old girl! What a great feeling! I was feeling it with you while I read. I'm so excited for you. Enjoy it!! Congrats! I thought it was a great opening :) Can't wait until it's published! I'll read it for sure!